This page may be of some value to Large Scalars who have never or barely used an airbrush. If you consider yourself skilled in the use of an airbrush, then you might as well move on because you probably won't learn squat. I got started airbrushing about in the mid 90's after attending a demo session hosted by Mac McCalla, a true artist with an airbrush. I wished real hard and Santa brought me one for Christmas. Then I proceeded to thrash around for about six months figuring out how to make the damn thing work. I've finally settled on a method that works for me, although its a little different that Mac's methods. Mac is a master, if I had to rate myself with Mac being a 10, I'm a 0.1. Much of the information that I present on this page I learned from Mac, muchas gracias, dude. My first brush was a Floquil Precision Flo double action internally mixed brush (top one in the photo) which works fine. I prefer this brush for acrylic paints as its easy to clean. I also have a Badger 100G brush, that also works fine. I use this brush for oils. These two brushes are a little different and each has its own advantages. 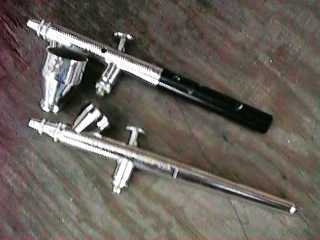 There are other manufacturers of fine quality airbrushes, some get really expensive. All of them will work fine. An airbrush is simply precision air driven paint sprayer. However, unlike your typical spray can or paint gun, the airbrush is designed to allow the spray pattern to be changed from a pencil line to a broad swath. The paint quantity can be varied from a fine mist to a one pass full coverage coat. No matter how careful I am with a conventional brush, I cannot achieve the uniformity in a thin coat that I can easily achieve with an airbrush. Further the paint goes on nearly dry, so that the model can be handled virtually immediately. The coating is thin enough such that fine details are not obscured as they would be by a thick layer of brushed on paint. The paint never seems to seep under masking like brushed paint does. A little paint can go a long way with an airbrush. This diagram shows the business end of a typical internally mixed airbrush. Air is injected around a "tip" which contains a very sharp needle valve. As the air rushes past the tip, the pressure drop draws paint from the tip in the amount regulated by the needle valve and the flow of air. The paint is atomized by the air flow and carried along to be deposited on the work piece. There is another type of airbrush called an externally mixed airbrush. In this configuration, the paint is ported out right at the business end of the brush. I've never used one, but Mac says that for our purposes, an internally mixed brush works better. There are two common types of internally mixed airbrush. They are called "single action" and "double action." The difference is how the needle valve is controlled. Both types of brush have a button on the top which admits the air when pressed. On a single action brush, this is all the button does. The position of the needle valve and therefore the paint flow is controlled by a knob at the back of the brush. On a double action brush, the button also controls the needle position so that both air and paint flow are regulated by the same button. Pressing the button admits air, pulling it back pulls back the needle and admits more paint. I have experience only with double action brushes, but it seems to me that a single action brush would be significantly harder to use in a modeling application. It should be noted that the air valve typically does not allow the amount of air to be regulated to any great degree. It is either on or off. Air flow can be regulated by setting the pressure on the air line. More air will create a bigger pressure differential and more paint will be drawn out of the brush. Thicker paints require more air to make them flow. If you are really interested in fine work, then turn the pressure down. The coverage of the airbrush is determined by the amount of paint dispensed and the distance between the brush and the work. The paint pattern expands in a cone, so that to paint a very fine line, the brush must be held right up to the work and the paint flow rate must be low. To cover a larger area, the needle is pulled way back to allow more paint to flow and the brush is held back from the work. If the brush is held way back and only a small amount of paint is allowed to flow, the surface will just be dusted. Airbrushes can have different tip sizes. They are usually graded fine, medium and large. However, a medium tip seems to work fine for all but the most exacting work. The Badger 100G comes with a fine tip and a replacement medium tip can be purchased. The Badger 100LG (with a larger paint cup) won't accept a fine tip, but it probably doesn't matter. Paint is held in various airbrushes in different ways, but there are three major methods, a top paint cup, a bottom or side paint cup or a paint bottle. I prefer a paint cup of some kind, I haven't found much use for a bottle. You typically need only a little paint of each color such that even a small cup holds plenty. A top cup model such as a Badger 100 family dispenses paint the easiest as the paint is gravity fed and a paint feed tube doesn't have to be filled. However, once you put some paint in the cup, you can't set the brush down without spilling the paint. The Badger 100 LG has a larger cup. You'll rarely need enough paint to fill this cup, but its larger size allows a finger and a rag to fit in the cup to help swab it out. The Floquil brush has a cup that mounts under and to the side of the brush. Since the cup is removable, it can be changed out for a bottle. Due to the angle of the cup you have a chance of being able to set the brush down without spilling the paint, especially if the cup is less than half full. However, this cup is harder to clean and the paint must be drawn against gravity making the brush a little more sensitive to paint viscosity. There are two popular types of model paint, acrylic or water based paints such as PolyScale and oil based paints such as Floquil. Both have advantages and disadvantages. As can be seen from the table, the oil based paints are a clear performance winner and the acrylic paints are a clear safety winner. For most applications, the acrylic based paints work fine, for the most exacting work, oil is preferred. It took me quite awhile to get an acceptable combination of acrylic paint viscosity and air pressure. I have settled on about 25% dilution with PolyScale airbrush thinner and 20 psi of air pressure. This low pressure limits the amount of paint that the brush dispenses and makes weathering easy. It may take several passes over an area to build up enough paint to be visible, but subtle coloring is what is desired for weathering. With oil, I just pour and spray. I got some documentation from Floquil Corp that states that their Poly "S" and PolyScale acrylic paints can be thinned with water. Maybe their water is different from mine, but believing this literature caused me no end of heartburn. Paint thinned with water spatters, runs and doesn't coat well at all. The PolyScale airbrush thinner actually works and even very thin paint works pretty well. I thin the acrylic paint until it pours like the oil based paints right from the bottle. With either airbrush, I can paint a finer line with the oil based paints, although the difference is minor. The Badger currently has a fine tip in it and it does a little better than with a medium tip, but the difference isn't significant enough (at least at my skill level) to matter very much. I've also noticed that the acrylic paints seem to continue to thicken as I get deeper in the bottle. I don't know why this is. It could be that the solvents are evaporating as the bottle sits, or it could be that I am still not mixing the paint enough so that the pigments stay near the bottom while I pour off the thinner paint at the top. I have to continue to thin the paint as the bottle ages. Even with the PolyScale thinner, if the paint is thinned too much, it starts to spatter. I cannot stress enough the necessity to mix the paint well, even if you've just used that bottle. The pigments settle fast. I use a brass rod to stir each bottle just before I use it and I fish around in the bottom of the bottle looking for clumps of unmixed pigments. Shaking the bottle to mix the paint is not a good plan as the paint tends to get air bubbles in it that make the paint spatter. Thinned paint separates even faster than new paint and requires vigorous mixing. I've also shot house paint with the airbrush. It needs thinning too, but for covering large areas such as backdrops, using $2/oz model paint can get expensive. I picked out a few sky and earth colors at Home Depot. A quart of paint will go a long way with an airbrush, but it takes awhile to cover a large area. I also got some white and black house paint which I use to lighten or deaden the other colors. If you have a really large area to cover with a single color (more than a few square feet), you are probably best off buying a cheap paint sprayer and running it off your airbrush compressor. House paint pigments are not ground as fine as model paints and they will tend to clog the airbrush if you shoot a lot. Actually, my choice of paint is determined mostly by the brush cleaning facilities available. In the basement of my cabin, I have a laundry sink available so acrylics are easy to clean up. In my garage at home, there is no water available but I have much better ventilation, so I use oils as I can use lacquer thinner to clean the brush without killing myself on the fumes. For the brush to work right, it must be clean of paint residue. The cleaning methods can be different for the two kinds of paint. For oil paints, lacquer thinner works really well. All you need is a wide brimmed can with a cover (an old coffee can works well) with enough lacquer thinner in the bottom so that you can dip the brush tip and cup in the thinner. When you are done with a color, pour whatever is left back into the bottle and spray the remaining paint out on a piece of newspaper or a rag. Wipe the cup with a soft rag if its big enough to get a rag into. Dip the end of the brush and the cup into the lacquer thinner and slosh it around a little. Then pour the thinner out of the cup and get another partial cup load. Spray the thinner back into the can and you're done. Acrylic paints can be cleaned out with lacquer thinner in exactly the same fashion, but this defeats the purpose of avoiding solvents. I have found that if running warm water (or a bucket of warm water) is available, then cleaning the brush is easier than with lacquer thinner. After pouring the excess paint back into the bottle and spraying out the remaining paint, I take the brush to the running water (a laundry sink next to my workbench) and run warm water into the cup to flush out most of the remaining paint. I then hold my finger over the end of the brush and blast some air with the needle pulled back. This backflushes paint into the cup which is then washed back out of the cup by the running water. I then work the needle valve back and forth while alternately blocking and unblocking the tip until there is no hint of paint coming back out of the cup. I then blow a cup load of water out of the brush and shake the brush and hold it at odd angles to get the last of the water to blow out of the brush. You don't want a load of water in there when you add new paint. With only a bucket of water available, I immerse the cup in the water and do the same backflushing operation, but it is necessary to dump the cup and let clean water flush back in fairly often. The Badger 100 is a little more difficult to backflush as the tips are more difficult to seal off with your finger. The fine tip has little holes in the side that vent the air and the medium tip has a jagged end that results in the same effect. The Floquil brush has a flat end that is easy to seal with a finger tip. Because of these features, I use the Floquil to shoot acrylic paint and the Badger to shoot oil. Never load new paint and apply the first spray to a model. Spray the first blast onto some newspaper or a rag or something to make sure that all of the cleaning solvent is purged from the brush and you get nothing but paint. After using acrylic paints for maybe a half hour or so, I find that paint builds up on the inside of the end of the nozzle. This results in splattering paint as drops build up onto and then blow off of this ridge. Since just cleaning with water will not remove this ridge, it is necessary to unscrew the nozzle (being careful not to stab yourself on the incredible sharp needle that is then exposed) and scrape and rinse this ridge off. While a similar ridge will tend to build with oil based paints, it usually isn't a problem as a douse in lacquer thinner usually takes it off before you notice its existence. After many loads of acrylic paint and water cleanup, a deposit of paint will build up in the color cup and inside the brush. Every few months or so it is necessary to get all this old paint off. Disassemble your brush and soak the METAL parts in lacquer thinner for a few minutes and all the old paint will soften and shrivel up. Wipe the parts up with a paper towel and give them another soak and they will be as clean as new. Here is where I climb way out on a limb. I am no expert at weathering cars and I am sure no artist, but I can make a car look old and dirty in a fairly convincing fashion. I'll leave the heavy weathering, or "trashing", to the experts. I just want to make the cars look used so here is my quick and dirty method. First I take off the trucks and wheels. I wipe the wheels with a alcohol soaked rag to clean off oil and grease and use a 1-1/8" by 1/8" rubber O-ring to protect the tread and flange. I then spray the wheels, front and back, with a light coat of Roof Brown. I've tried various combinations of Rust, Grimy Black and Railroad Tie Brown, but it turns out that you can't really see a detailed job of weathering the wheels when the car is on a layout anyway. For display models, the extra work is worth it, but for a running model, solid Roof Brown does fine. If you get paint on the tread, wipe it off with a Q-tip soaked in lacquer thinner. If you want a little bit better affect than just using Roof Brown on the wheels, you can first paint them with Rust and then darken them just a little with Roof Brown. This give a two tone effect that is somewhere between the two colors. I've found that is easier to get a pleasing effect by using lighter colors first and then darkening with progressively darker colors. I then hit the truck side frames with Earth, just a light spray to look like splashed dirt. Much of the black plastic should still show through. I then hit the couplers with Roof Brown or Rust and then a wisp of Roof Brown. Be careful when painting couplers such that the paint doesn't interfere with the coupler function, see The Care and Feeding of LGB Knuckle Couplers. Even the thinnest wisp of paint on the faces of Kadee couplers will prevent them from coupling at all. If you do get paint on the faces of the couplers, not to worry. Clean it off with a Q-tip dipped in lacquer thinner and then lubricate the faces with a little graphite. I then hit the car underbody with Earth, only painting details that can be seen when the car is on the track. The coating is light so that the black plastic shows through the paint. Painting the car body is a matter of choice. I'll often paint the car with the same color that it is already just to dull the plastic sheen and to make lettering to look old and thin. This will also dull the handrails. I'll then spray Earth along the bottom of the sides and ends to look like splashed dirt. When Earth is sprayed to look like dirt, spray from the direction that splash would come from. This produces some shadowing of the paint by the relief of the model and produces a more realistic effect. I fade the roof color to look like sun fading with Roof Brown or Earth depending on what color it is already. If the car is a really bright color, I'll may go over it with Roof Brown, Earth or Engine Black to deaden it. I might add some rust streaks down from bolt details, rivets, or hand rails. Mac's technique is to paint a thin streak with Rust and then widen and darken it with a very light overcoat of Roof Brown. An airbrush is a compressed air driven device, so in order to use it you need a source of air. You can spend $200 or so and buy yourself a small quiet compressor especially designed for airbrushing, or you can get cheap and spend a lot less. All you really need is a source of clean, reasonably dry air regulated at 20 to 40 psi. You should be able to adjust the pressure. I use an old Sears paint sprayer compressor with a Pep Boys regulator. The compressor is noisy, but it was already sitting in my garage. The regulator was only about $15 with a pressure gauge. For low pressure work, I also use an old pump that was part of a medical apparatus. It does 20 psi and works fine without a regulator or water trap. One old guy (I can't remember who) told me that he uses a light truck tire pumped up to 50 psi and then regulated down to 25 psi. He said that it lasted over an hour. If you have an old shop compressor hanging around, it'll work fine too, just hang a regulator on the output and shut it off until the pressure falls too low. If you live in a humid environment, you might want to add a water trap, especially if you shoot oil. Again, you can pay $50 for one at an artists supply store, or $18 at an auto parts store. If you don't trap water, every so often the brush will "burp" and splash water on your work. It always happens at the wrong time. When you use an airbrush (or any paint sprayer for that matter) you expel solvents and paint particles into the air. Unless you protect yourself in some way, you will end up breathing this crud. None of it is any good for you. All of the methods that you can use to protect yourself are either expensive, inconvenient or uncomfortable, but you should do something. In any case ALWAYS work in a well ventilated area. Spray Booth. A spray booth will draw all the paint vapors and particles into a filter and then expel what is left out of doors. Booths tend to be expensive and you can't always work in one. Large scale equipment may be hard to maneuver in a booth and if you spray paint on scenery you can't use a booth anyway. Work Outdoors. You get real good ventilation out of doors, but this usually limits your available painting time to daylight and nice weather. Unfortunately, most of our painting gets done when the weather is too terrible to run trains. You should wear a good mask anyway. Masks. You should invest the $30 or so and buy a good industrial quality dual filter mask. Any paint store or homeowner store will have them. I got one made by 3M that is rated for painting use. These are somewhat uncomfortable to wear, but you get used to them. They do a excellent job in filtering out the paint particles and a good job in filtering out the solvents. I can't smell the lacquer thinner spray while I am cleaning my brush while wearing the mask. Without the mask, the fumes practically knock me over. The masks filter solvents with an activated charcoal layer in the filters. These filters have limited life and they will load up by themselves on moisture extracted from the air. Change the filters often and keep the mask in a sealed freezer bag when it is not in use. A cheap painters mask will not cut it for oil paints. It will stop some of the paint particles, but the solvents will get right through. It might be OK for acrylics if you have really good ventilation.